"What Do You Mean 'No Redemptions'?" News of the 150 year jail sentence you may be facing has reached The Reformed Broker in his lair this evening and so I decided to take a moment out to offer some advice. Picking a prison gang is an important choice, not unlike choosing a Palm Beach country club or a Hebrew School for Mark and Andy, so its good to have all the facts in front of you before you affiliate. Cigarettes are the primary monetary system in jail, even among the non-smokers. My advice to you would be to NOT offer anyone your services managing their cigarettes. Running a Marlboro Ponzi Scheme will get your throat slit, not this penthouse-arrest nonsense. Before joining a set, make sure that their membership on the outside hasn’t lost laundered drug money through your fraud. This probably means you shouldn’t try to be down with Colombians, Russians, Israelis or of course, the Greenwich WASP Mafia. You’ll Probably Want to Avoid the Aryans, too. Look, many of the most prominent prison gangs are below quota this year so there will be open slots, but one gang you shouldn’t pledge would be the Aryan Brotherhood. Dude, you’re like, the epitome of what they stand against. When you first enter General Population, there will be many different factions vying for the honor of “protecting you,” by which I mean, of course, extorting and blackmailing you. They will believe that you have a big stash hidden somewhere that will one day be up for grabs. Don’t be afraid to lead them on, you can get a ton of mileage out of it if the cholo’s think there’s a few million coming to them in the end. Just because you get inked up and join a gang, doesn’t mean you can afford to be unprepared. Use what you have handy to protect your billion-dollar hide. For example, the frames of your Oliver Peoples eyeglasses can make an excellent shiv with a minor amount of sanding and sharpening. 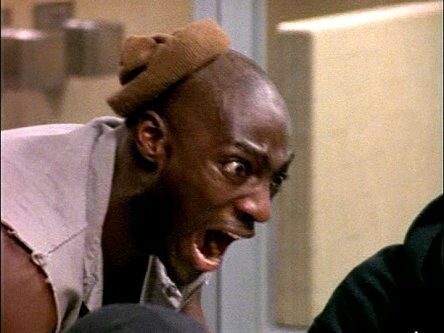 At a certain point, probably within the first 17 minutes, there will be an enormous Nigerian inmate with a miniature cap cocked to one side that will want a word with you…in the back of the laundry room. Start accepting this eventuality now, there is no way around it. The incision should track the vein down the length of your forearm, not run laterally across the wrist…a very common mistake amongst teenage girls who think they’re too fat. Get it right on the first try, because once you’re placed “under observation”, it’s game over. March 8, 2009 Madoff Newsflash: Bongiorno, Annette!